Vacations and family outings are wonderful ways to introduce children to new places and interests. Take advantage of that time away from home — try a unique activity that allows kids to connect with a different part of their world. One of the easiest ways to squeeze in a little learning during your vacation is to visit historic sites and attractions. Living history museums and historic buildings exist in every state and every country around the world – many cultures and cities are very proud of their history and want to show it off! Kids will enjoy historic attractions that incorporate hands-on activities, such as farm chores, dressing in period clothing and partaking in daily activities children of their age would have enjoyed. Touring memorial sites & monuments unique to your destination also offer great windows into history and many children will be able to connect their visit to a topic they learned about at school. Before you head out on your trip, pull out a map and show the kids your destination. Talk about whether your vacation spot is east or west of your home. Ask the kids to estimate how far away you will travel. Incorporate math for older kids by challenging them to find out how long the trip will take if you are traveling by car. And all kids will enjoy learning about the different topography of the area – will there be more mountains or lakes? Are you visiting an area that will be much warmer or colder than your home? Each of these topics will help kids to compare and contrast their vacation spot with your hometown. Many people think of art when they hear the word museum; however, there are many different types of museums that families can explore while on vacation. Children’s museums are very popular with kids due to the many interactive exhibits they offer. Natural history museums will usually offer exhibits of prehistoric life, a view into the unseen areas of nature and unique science programs. Art museums can also be very entertaining and educational – many will offer scavenger hunts, children’s programs and engaging ways to experience the art. One truth that seems to be universal – children love animals! On your next vacation or family outing, spend some time with animals native to the area. For example, if you plan to visit the beach or coastal town, explore tide pools and marine animals. Try new activities that involve animals such as horseback riding. Research some of the local or national parks at your destination to learn about endangered animals that you might be able to visit. And take advantage of any one-of-a-kind animal encounters or activities that may be available at a local zoo. Consider spending a day exploring nature, taking a trail hike or attending an outdoor program. Many of our children aren’t offered as much time outside as we had while growing up. One of the great ways to introduce them to nature activities and outdoor skills is through the Junior Ranger Program offered at many of our national parks. Kids ages 3 – 12 will be sworn in as an Official Junior Ranger once they complete some fun outdoor activities, ranger-led programs and nature exploration. For more details, visit the National Park Service Ranger Zone website. Another wonderful way to learn includes exploring different cultures and customs. If you are traveling to another area of the country, or a different country altogether, kids will enjoy discovering more about how other people live, celebrate and play. Explore what activities people native to the area enjoy, eat at local restaurants or consider taking a cultural tour. Another popular activity for families is to attend a cultural festival or local seasonal celebration. 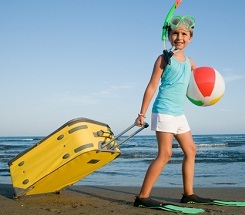 Traveling offers many practical learning opportunities for kids too. As you prepare for your next trip, take some time to highlight the life skills that are important to travelers. Packing a suitcase, budgeting money for souvenirs, learning how to greet people and trying new forms of transportation are all wonderful new learning adventures for children. Teaching them these skills at a young age will serve them well as they grow to be world travelers.